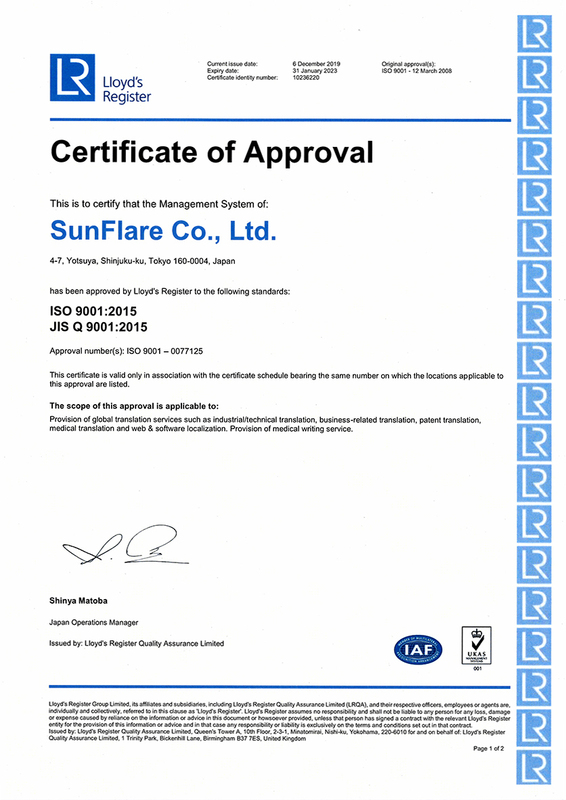 Our Three Strengths - About SunFlare - SunFlare Co., Ltd. 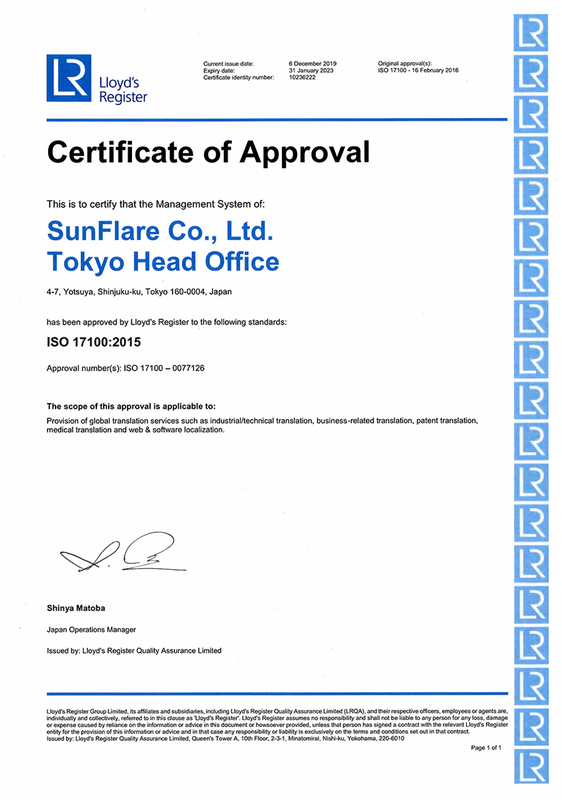 The services provided by SunFlare are based on a proprietary system that is designed to ensure that its documentation products are delivered securely and reliably. We aim to provide optimal solutions based on the principles of quality and security, both of which are essential requirements in business. 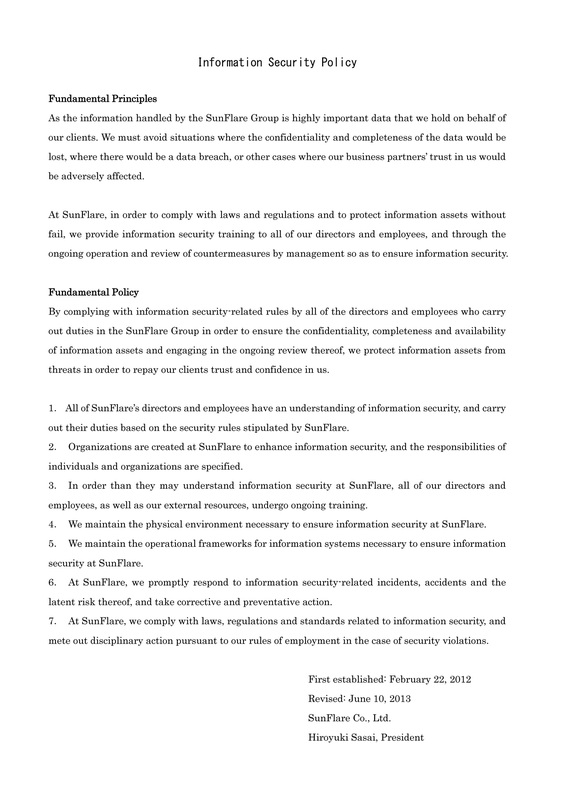 All SunFlare Group executives and employees abide by the company's in-house rules concerning information security. We retain our clients' trust by protecting their information assets from threats through the conducting of periodic reviews to ensure safety, confidentiality and availability. 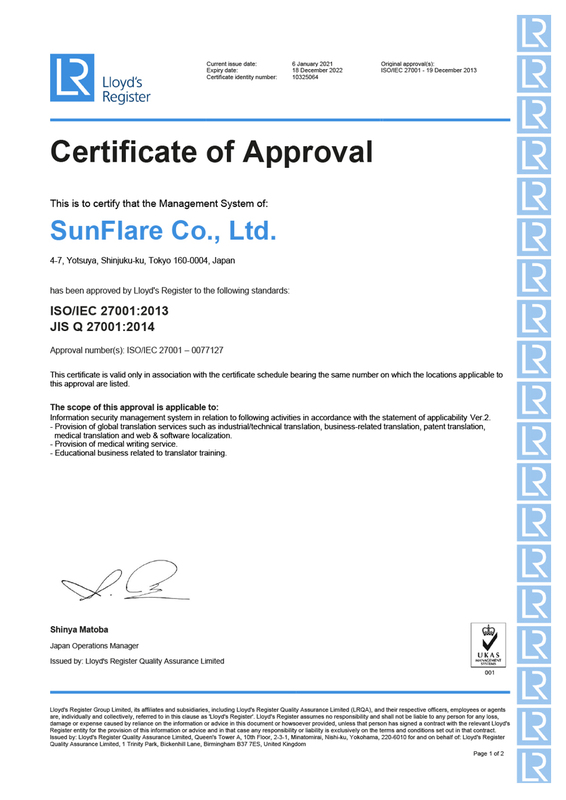 Keenly aware of the importance of information from past client projects, SunFlare acquired ISO 27001 certification, which is an international standard related to information security management, in December 2013. We have established a system that comprehensively manages all facets of security—including in terms of people, information communication systems, working areas, and supplier management—and conducts periodic reviews to ensure safety. To conform with ISO 27001 specifications, we have established ISMS rules and regulations, including an information security manual. We continuously implement improvement measures based on the conducting of management reviews and periodic internal audits within a security management system. We have also established an accountability system and procedures to ensure that we respond quickly, effectively and systematically in the event of an information security incident. We have installed a system for controlling access to the office area. Employees are allowed to enter the office only after their identity has been authenticated using their IC staff identity card. Anyone wishing to visit the office must fill out an admission request form and then wear a visitor card. Visitors are accompanied by an employee at all times while they are in the office area. All of our part-time staff, full-time employees and outsourced staff, including translators, enter into non-disclosure agreements and are required to comply with our confidential information management regulations. All of the information that we receive from the client is treated as strictly confidential. The management requirements stipulated in our confidential information management regulations describe the handling of electronic and paper-based data in terms of the following categories: 1) the copying of confidential information; 2) the disclosure and distribution of confidential information; 3) the electronic transmission and accessing of confidential information; 4) the forwarding of confidential information; 5) the carrying of confidential information; 6) the storage of confidential information; 7) the disposal of confidential information; and 8) the recording of confidential information. In accordance with these regulations, translators are required to adhere to restrictions on the printing and copying of the files that they are assigned, to delete the files after the completion of their work and to submit a report on the status of these files. Employees receive security training when they join the company and on an annual basis thereafter. Translators are subject to annual reviews based on our contractor assessment standards. We authorize access to shared information areas on a need-to basis in order to prevent unauthorized access. We install and regularly update antivirus software on all of our computers and servers. We conduct automatic cloud backups of our server data. We conduct system monitoring and log archiving for the main company servers and network devices. We operate real-time information sharing for all team members through mailing lists and portal websites with access limited to only those involved in the project. We use ANDEX, our proprietary encrypted file exchange system, to encrypt data exchanged with our clients via communication pathways, and we use our FilePort system to encrypt all communication pathways when exchanging files with our outsourced staff. ANDEX is the browser-based file exchange system that we use for communication with our clients. As this protocol uses Secure Socket Layer (SSL) for encryption, it differs from standard file transfer protocols in that data cannot be viewed while it is being transmitted to SunFlare from external sources, thereby providing security and peace of mind for our clients. FilePort is the system that we use to exchange ﬁles with translators and other parties working on a project. All of the files are encrypted so that they cannot be viewed on external systems, thereby enabling data to be transmitted quickly and securely. Employing these high-security information systems allows us to perform our operations quickly and securely. We incorporate uninterrupted information security into our business continuity planning (BCP). We hold emergency drills once every year. We conduct redundancy preparations for stand-by equipment and alternate routing to ensure that we are prepared for any eventuality. SunFlare's affiliated company ANDROMETEC Co., Ltd. develops and operates our information system infrastructure based on ISMS and PMS. ANDROMETEC supports our business operations by managing the operation and maintenance of our information security systems during external evaluations and internal audits. SunFlare handles a wide variety of personal information from clients, employees, SunFlare Academy students, registered translators and content creators, and respondents to recruitment ads. To ensure that we handle such information appropriately, we acquired a Privacy Mark, which calls for the implementation of stricter management practices than those required under Japan's Personal Information Protection Act, on December 12, 2014. We have also established a personal information protection management system (PMS), for which we conduct employee training sessions to raise awareness of the system's operational rules throughout the company. In accordance with our management philosophy of contributing to societal advancement and harmony by providing translation and documentation services in fields related to cutting-edge industrial technologies and culture, we cater our services to the needs of the individual client with the aim of helping them to achieve success. 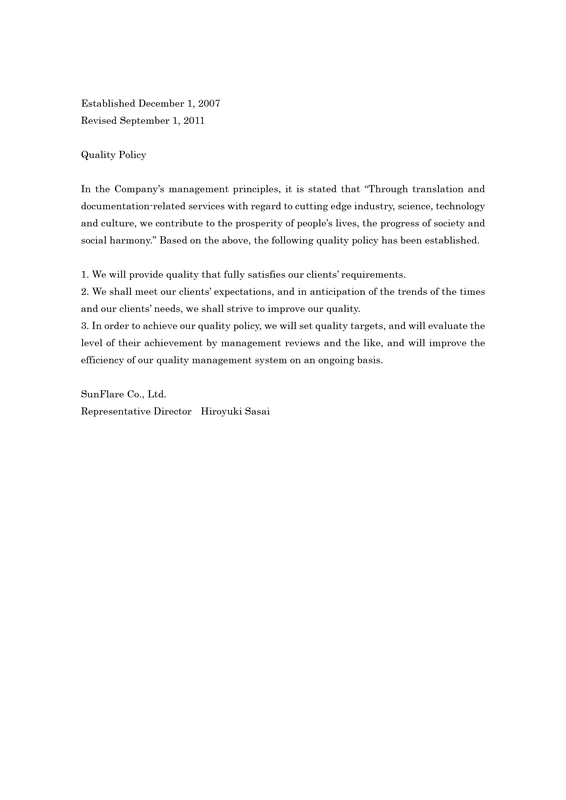 To ensure that we meet the highest quality standards, we have acquired ISO 9001 certification and deployed methods and processes for improving quality throughout the company. ISO 9001 is an international standard for management systems that focus on the processes involved in creating products and services. It maintains and manages quality at the executive level. We apply our ISO 9001 certification in our ongoing improvement activities and the creation of quality products and services that incorporate IT technologies. We have established a system that does not leave quality control to the translators alone. To ensure a reliable level of quality, each task is divided up into specialist categories with expert staff members at the helm for each process. Having specialist staff carry out documentation engineering allows us to provide advanced DTP processing and engineering services that can meet challenging client needs, including strict style requirements, terminology and prose control, and short deadlines. We have created and operate a management system that is not dependent solely on the skills of individual employees by applying IT technologies to support work process management. We take on board client feedback and conduct CAPA. We implement initiatives for ongoing improvements by incorporating a PDCA cycle. In addition, we regularly monitor our operations by carrying out internal audits, with the results then being applied to confirm and improve our work processes. Because we have expert staff who specialize in specific industries and businesses, we are able to handle projects in a diverse range of industries and categories. SunFlare helps its clients' to achieve global success by recruiting expert staff with superior language capabilities and taking full advantage of their knowledge and information in a diverse range of fields to meet any request. SunFlare delivers products and services quickly and securely in accordance with the relevant quality requirements by employing proprietary systems or integrating commercially available systems and applying them to services including translation, writing, editing, proofreading and document revision. The following capabilities are what make it possible for us to deliver our services. As documentation experts, we have established a development system for short-term developments. We make improvements to this system on a daily basis to ensure that it can quickly conform to any new client requests. In terms of security measures, we prevent the disclosure of client information by implementing every possible measure to ensure confidentiality. To ensure that we are prepared for all eventualities, we have implemented measures to provide system redundancy and conduct backups. We have also established a system that allows us to continue operating in the event of a disaster to avoid delays caused by system failure. We refer to such client support activities, including in-house collaborations involving IT technologies, as "AIRKEP." What is the concept behind AIRKEP®? "SunFlare takes the 'knowledge' from cutting-edge technologies and combines 'artificial intelligence' mechanically with software ('robotic') to maximize our translators' creativity and intellect to realize speedy translation processing. This creates a win-win situation in terms of growth for both SunFlare and the translators, thereby resulting in prosperity and happiness." This concept is aimed at creating an "enterprise paradise." Even with the evolution of artificial intelligence and quantum computers, we believe that human creativity will remain superior in some areas. The AIRKEP concept is aimed at creating a Total Quality Management (TQM) system that forms an organic network of "people and hearts" based on creative individuality combined with the positive elements of machinery. The AIRKEP concept also offers prompt and effective support for the evolving advanced globalization of our clients. It is a long-term vision that creatively challenges the use of language with an eye on the future.